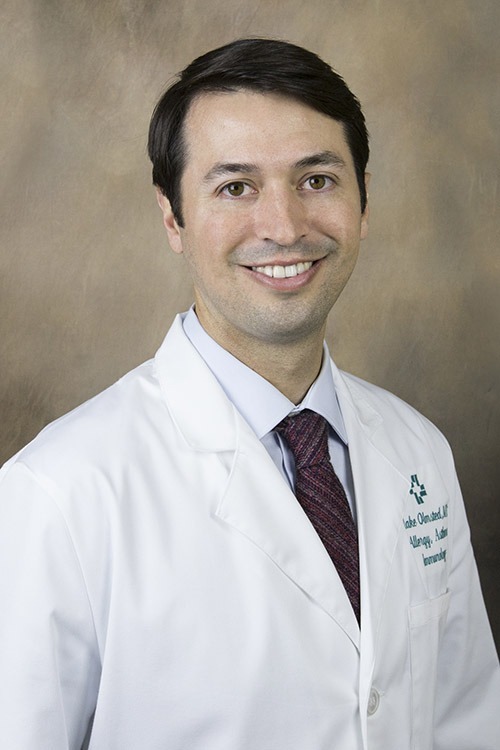 Blake R. Olmsted, MD, is an allergist/immunologist at Hattiesburg Clinic Allergy Asthma & Immunology. Dr. Olmsted received his medical degree from the University of Mississippi Medical Center in Jackson, Miss. He completed both an internship and his residency in internal medicine at Medical University of South Carolina in Charleston, S.C. He also completed a fellowship in allergy and immunology at the University of Mississippi Medical Center in Jackson. Dr. Olmsted is board certified in allergy and immunology by the American Board of Allergy and Immunology. He is a member of the American Academy of Allergy, Asthma & Immunology, the American College of Allergy, Asthma & Immunology and the American Medical Association. At Allergy Asthma & Immunology, Dr. Olmsted treats children and adults with asthma and allergic conditions, including nasal and eye allergies; eczema; hives; food, drug and insect allergies; angioedema and anaphylaxis. In addition, he has special training in allergy skin testing, allergen immunotherapy and spirometry breathing tests. Hattiesburg Clinic Allergy Asthma & Immunology provides specialized care through testing and treatment of allergies and asthma in pediatric and adult patients. Dr. Broome has training and special practice interests in allergic rhinitis (nasal allergies), pediatric asthma, food allergies and eczema. American Board of Allergy and Immunology.